And we did have traffic, although Paulino did his best to get us out of the city and onto the road heading north and east before the 11:00 rush hour. Why rush hour at 11:00, we asked Rita? Because that’s when people go home to eat lunch, and have a rest, before returning to work later in the afternoon. 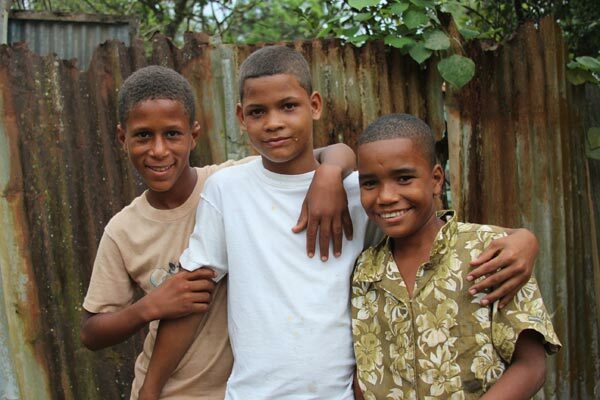 Boys in the La Colonia neighborhood of Cotui. We picked up Andres by the side of the road, and pushed out of the city until we needed a bathroom stop, where Andres told me that we had a problem with one of the tires on the trailer (one of the tires on the van didn’t look so hot, either). We would stop further ahead to get it fixed, he said, and I felt that this was only appropriate, that it wouldn’t be a Latin American road trip without a flat tire, with everyone waiting around under a tree, sipping Cokes, while hammer-on-iron sounds pulsed from a concrete-block garage. Except we didn’t stop, despite Rita’s gentle questioning about the status of the tire. (It wouldn’t be a Latin American road trip without a little bit of macho brinksmanship, either.) We made good time to Cotui, only lingering to buy pineapples for our lunch at a roadside stand, where honey hung in reused plastic whiskey and soft-drink bottles and tall stalks of brown sugar cane – about as thick as a baseball bat – were stacked to be hacked into chewable chunks. Lunch at the home of Rita’s childhood friend, Chi-Chi, which will be our home base. We ate chicken and rice and beans and rested for an hour, enjoying our own siesta, before heading off to visit a women’s group in a poorer neighborhood of Cotui, called La Colonia (“the colony.”) Rita has worked with this group for six years, helping them get organized and build an open-air community center, and start a bag-making project. The women's group we visited in La Colonia. At first, the visit unfolded as I expected: formal introductions, with the 25 women going around the circle, standing one at a time to say their name, their address, how long they’ve been with the group, and how glad they were to have us here. All very moving. And then it was our turn, to say that we come from places much colder than here, and that we are also glad that we came. I said that I live only five miles away from Sharon Academy, which was one of the groups who helped fund the building where we were having our meeting, along with King Arthur Flour and the Norwich Congregational Church. And then the meeting turned, in ways entertaining and enriching. An old buddy of Chi-Chi’s husband brought out a guitar, to sing with force and passion, his eyes closed. One of the women joined him for the first song, for which they re-wrote the lyrics to the old Cuban standard, Guatanamera. The words they wrote were in honor of Rita, talking about how much they have appreciated her work with them, and her presence in the community. Bringing tears to everyone who understood the lyrics and Rita’s commitment. Then more songs, and even dancing, and hilarity, and I thought about how much I love this culture, where people do not have the same reservations as we Norteamericanos about showing feelings and emotions, even with strangers. My highlight of the day came when one of the group’s founders, Ana, approached Tom and asked if he could follow her with his video camera. I went along as a translator, walking through the stony streets for two or three blocks, talking softly, until we arrived at her house. The women’s group’s main project is making colorful handbags from plastic shopping bags they find discarded in the street. Doña Ana wanted to show us her house, which she has been able to build and furnish with the profits Rita makes selling the bags the group makes in the United States. We talked about how her children got sick often when she lived at her old house, in the same neighborhood, and how she has been able to make about 25 bags so far this year. It takes her about three days to make each bag; she first finds the plastic bags in the street, washes them, dries them in the sun, then cuts them into ribbons with scissors before knitting the bags together in multiple colors. 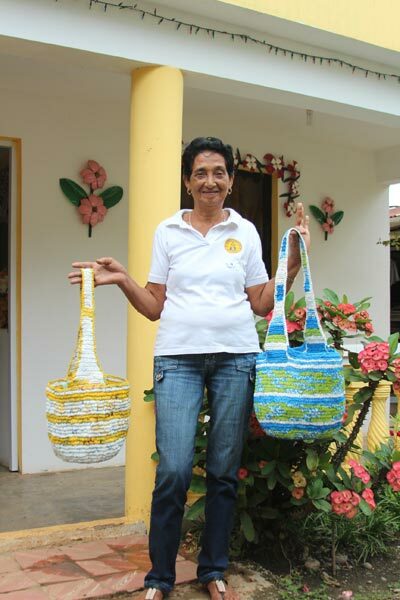 Doña Ana with her bags, in front of the house she had built with the profits from the bags. I took photos of her outside her home – justifiably proud – then told three neighborhood boys who had been lingering that I would take a photo of them as well. The boys didn’t mind posing, and Doña Ana didn’t either, and neither did the women with the bags when we returned. Great spirit. To the school, where I talked briefly with the headmaster, and others played games with the children on the concrete playground. Into the van again, to tour the reservoir outside of town, and briefly take pictures at another school that Rita has connected with Sharon Academy, then to take photos of the lake. And, finally, back to Chi-Chis, where we met our host families, a real test for the folks who speak little Spanish. The families are largely professionals who live in Cotui, and I enjoyed hearing our doctors talking shop across language barriers. Tom and I have been placed in the village of Maguaca, with Doña Fina and her husband, Don Gambo. Dinner of yucca, warmed bananas, potatoes. Questions about our children, about trees, farms. One of their daughters lives in the capital, and is a dentist. Another daughter lives in Barcelona. The family has a farm, and Gambo – who makes a living by purchasing crops and reselling them – has promised to show us tomorrow how they grow and process cacoa. Dogs barking, roosters crowing as we readied for bed. The thumping music from the bar shut down at 10:30, but in the heat we need to sleep with the windows wide open, and this is far from quiet chilly Vermont, although the sounds of chickens are the same here as at my home. Wednesday will be another big day, but we are where we are supposed to be, and soon, we will begin the actual medical work, gradually emptying the suitcases we packed, while remaining cognizant of how Rita likes to do development: helping communities build their own capabilities, instead of simply providing gifts. We’ll have cacoa in the morning, travel back into Cotui, and then head out for another full day. But first I need to string up the mosquito netting, and insert my earplugs, and dream in Spanish. Your blog is so great–I can hear it, smell it, feel it–but not taste it, what a shame. Thanks so much for making it real for us homies. As for my husband, that Tom, this is what he was born for. You will get him home, right? Absolutely! And thanks for reading. Hello! I’m Laisa Nunez, I’m from Cotui and some of you are staying at my house, with my parents. Hope you’re having a great time. Hola, Laisa. Thanks for reading! I’ll find out exactly which members of our group are staying with your parents. Ryan, they say when one dreams in spanish you have really become one of them. I am enjoying your reporting, well done, sounds much like here.